If you’re looking for a fabulous cabinet grill to add to your backyard kitchen, look no further than the Char-Broil Performance TRU Infrared 450 3-Burner grill (model 463371316). This grill offers ample cooking space for your friends or family and a sleek, stylish design that you’re sure to love. 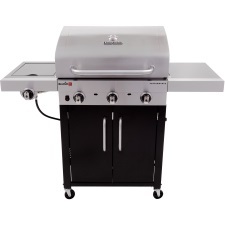 With its Surefire electric ignition and three powerful burners outputting 24,000 BTUs, you’re going to enjoy throwing your favorite steaks, chicken, or burgers on the grill. These are perfect for the mid-size grill requirements where you want to be able to cook more than the smaller versions but you’re not quite ready for one of the much larger size grills yet. Harnessing greater temperature control, the TRU Infrared system by Char-Broil makes it easy to cook your food evenly every time you grill. The infrared technology makes sure that you have more access to controlling the temperature to a more precise level, without any guess work. With this type of cooking system, you do not have to worry about the common hot or cold spots you may experience with other grilling systems. This model allows you to rest assured that your items will cook evenly throughout and that you have ultimate control over what temperature they are cooking at. Perhaps you started out with a smaller grill but are ready to move up to a grill offering more room to cook delicious food. That’s what you’re going to receive with this amazing Char-Broil model. It is perfect for you to cook for your family, when you have a few friends over, or for your backyard BBQ throughout the summer. It is a great size to throw on multiple items without worrying about items getting cold while you’re finishing up the cooking process. You’ll have ample room to cook your favorite burgers and hot dogs, chicken wings, or even a steak when you’re ready. It’s the perfect size to offer more grilling space without being too large and having wasted areas. At the time of writing this review, there are 62 customer reviews on Amazon alone, not counting other sites where this grill is available. The Char-Broil Performance TRU-Infrared 450 3-Burner Cabinet Gas Grill received an overall 3.9 out of 5 stars. In general, customers were very pleased with their purchase. The grill costs around $300 and is loved by those who are looking for a mid-size grill for their homes. Some of the negative reviews that were found stated things such as the grates flaked, the wheels seemed too small to safely roll the grill around, and some people were missing parts or had damaged grills when it arrived at their home. There were, however, several positive reviews from customers who absolutely loved this Char-Broil cabinet grill. Most who reviewed their purchase gave the grill high marks as they were very pleased with their purchase. Those who gave it a high review stated … “Great grill” … “Best deal for the money” … “Awesome grill” … “Consistent cooking” … “Five stars!”. In summary, if you’re looking for a mid-size grill to fit on a smaller patio or deck, then the Char-Broil Performance TRU-Infrared Cabinet Gas Grill is a great choice. It can fit any budget you may have and is perfect for cooking for two people or a few more. You can have a sleek, stylish unit adorning your backyard area for less than $320 and it will ensure efficient and even cooking each time you fire it up. This powerful unit offers a great way to hide your propane tank and grilling tools for a clean look when you’re not grilling. Consider this particular unit if you’re looking for a grill that offers great temperature control, powerful burners, and delicious items cooked to perfection each time you want to grill. This is a great choice for those in rental homes or condos who may have a smaller patio or backyard area.